Following in the footsteps of Keith Haring and Basquiat, a new generation of street artists is currently conquering the world’s art markets. The documentary portraits the most influential artists in New York, London, Paris, Sao Paulo and Tokyo, featuring New York Grafitti legends Futura 2000 and Ramm:ell:zee as well as the new generation of artists featuring Banksy, Os Gemeos, Space Invader, Zevs, WK Interact, Blek Le Rat, Barnstormers, Espo, André, Noki, Miss Van and Eine. 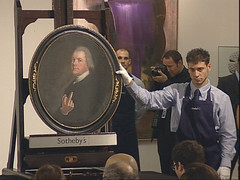 Collector Agnés B and art curator Jerome Sans comment on the artists and their innovative works. Soundtrack by Stereo MC’s, Klute and Pieter K.
Introduced by its author, Sebastian Peiter. 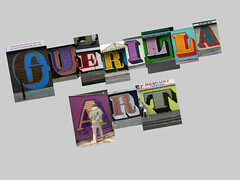 Guerilla Art publication available in Lab store. Tim Marlow - White Cube Gallery Curator. "I have just found out about the book called GUERILLA ART by Sebastian Peiter, probably one the best books about graffiti and street art concepts. I really like the fact I am part of it. Thanks." WK Interact - Street Artist.